I’d been asked to make a cheesecake for a family feast. 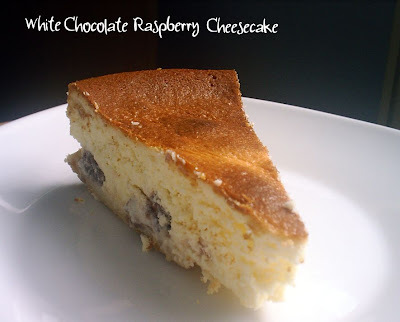 I wanted to make something different from traditional heavy cheesecakes we usually eat in Poland. I opted for a White Chocolate Raspberry Cheesecake. Combining raspberries and white chocolate always tastes heavenly. So, does in this cake. The sweetness and mildness of white chocolate balance perfectly with the tartness of the raspberries. The only thing I would change is the crust which turned out rather tough. I think it would work out better without white chocolate addition. I’ll try that next time. The recipe originally comes from The Australian Women's Weekly 'Cheesecakes, Pavlovas & Trifles' but I’ve found it translated into Polish on Galeria Potraw which is my favorite Polish food forum. 1. I added vanilla sugar to the cheese. 2. I substituted digestive biscuits with Petit Beurre ones (they’re easier to obtain in Poland). 3. I baked my cake for about 60-70 minutes instead of 90 minutes as the recipe says. Line the bottom of 23 cm springform pan with aluminum foil. Using a food processor or blender, process the biscuits to fine crumbs. Melt the chocolate and butter together over low heat, stirring constantly. Combine with the crumbs. Press into the bottom of the springform pan with the back of a spoon. Put into the fridge for about half an hour to set. Preheat the oven to 160C (320F). Put the cream in a heavy-bottomed pan. Bring to boil over low heat, stirring constantly. Break the chocolate into little pieces and add to the cream. Stir with a spoon until the chocolate and cream are smooth and the chocolate is melted. Set aside to cool slightly. Beat together the mascarpone cheese, quark cheese, sugar and vanilla sugar until smooth, then add 3 eggs, one at a time, beating well after each addition. Add the chocolate mixture beating until well-combined. In a separate bowl, whisk the egg whites to sniff peaks then fold into cheese mixture. Pour the cheese filling into the chilled biscuit base. Gently press 250g of the raspberries into surface. Bake for 1-1 ½ hours. Cool in oven with door ajar. Refrigerate for at least 3 hours or overnight. Copyright © 2008 For the Body and Soul. You may not copy or otherwise reproduce any of this material without prior written permission.